like Peter’s writings better than any New Testament contributor because he’s so much like most before the Holy Spirit’s change. Babbling Peter said whatever he wanted, whenever he felt it, just like so many Christians and nonChristians do every day. Remember when Jesus moved to wash his feet, Peter said, “Right Lord, but if you do, give me a complete bath” (John 13:5-11). Peter’s intent wasn’t rebellious, just emotional to the point of blabbing what he was feeling at the time. He didn’t get the servant teaching Jesus was trying to show him, and made it clear. When Jesus announced He would sacrifice His life, Peter warned the Lord to avoid it, earning Jesus’ rebuke of the devil speaking through him shaming the disciple for his foolish words (Matthew 16:21,23). When Jesus prophesied He would be denied by all when arrested for crucifixion, Peter said, “Others may fall away from you Lord, but I won’t be one of them. No, not me!” to which Jesus prophesied Peter’s three-fold denial when confronted Passover night (Matthew 14:27-31). But it was also Peter who spoke up when none of the others dared answer Jesus’ question regarding His identity. For that, Jesus changed his name from ”Swaying Reed” (Cephas) to “Rock” (Peter) and signified the heart of this man who received the revelation as the foundation on which Jesus would build His church (Matthew 16:13-20). 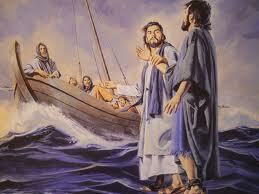 And it was Peter who by faith is the only mortal to ever walk on water. While the others trembled in fear thinking they saw a ghost on Galilee, Peter said, “Lord if it is you, say come, and I’ll come,” and he came. That’s right, Peter walked on the water before he got his eyes on the storm raging around him and started to sink (Matthew 14:22-32). Following his conversion, it was Peter who preached on Pentecost, causing great revival (Acts 2). It was Peter who healed the lame man in Jesus’ name while passing by for afternoon prayer in the temple, causing great revival (Acts 3:7). It was Peter who healed Aeneas (Acts 9:34, 35) and raised Tabitha from the dead, causing great revival (Acts 9:40-42). In fact, Peter was so anointed with God’s healing power that the people “…even carried the sick out into the streets and laid them on cots and pallets, so that when Peter came by at least his shadow might fall on any one of them” (Acts 5:15). And it was Peter who was entrusted with the in-grafting of the Gentile church, while receiving a prophetic vision that taught Gentile salvation was God ordained, a Roman captain received the visit of an angel, putting the two together for Peter’s preaching in the officer’s home. All assembled were saved and baptized in the Holy Spirit (Acts 10). Wow. 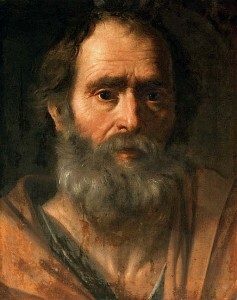 The early church looked to Peter as its founding Christian leader. There is no other church leader in Acts, until the conversion of Paul, the Spirit consistently chronicles. Philip’s ministry in Samaria gets a chapter of Acts press, revealing a model of ministry similarity to the Lord Jesus Christ’s (Acts 8). Signs and wonders and even the apostle’s translation are revealed in this powerful chapter. Peter’s epistles reveal him as a model of Christianity and serve as a revelation guide-book for the general church. Peter’s blabbermouth days ended after the resurrection. When he says in 1 Peter 4:11,”Whoever speaks, let him speak, as it were, the utterances of God,” we see a born-again man who understands Christian faith. Peter came to learn that his words were empowered by God when he conversed with others, preached a sermon, healed the sick, and raised the dead. In 1 Peter 3:18 the Holy Spirit revealed to Peter Jesus’ netherworld preaching to those who were once disobedient in Noah’s Day that leaves you simply wondering about the event. Wow. Second Peter gives the most comprehensive teachings on the ministry of a prophet anywhere in Scripture. Peter’s prophetic insight into last-days mockers and immoral teachers out for wicked gain reads like TV news and newspapers today (2 Peter 2). It is Peter only who tells us the Spirit of Christ dwelt in God’s prophets to reveal His revelation (1 Peter 1:11). It is Peter who reveals our church conversion as living stones of a temple in which the born-again Christian is a chosen priesthood who offers up sacrifices of praise (1 Peter 1:9). Peter gives us as much lifestyle teaching as Paul in his directives of social humility. Before his conversion Peter was an honest, interested, and misguided man. 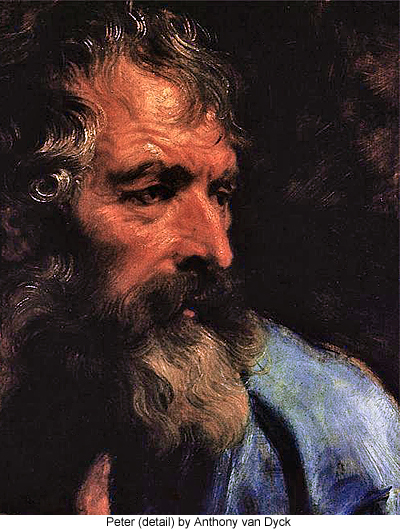 After his conversion Peter was an honest, interested, and Holy Spirit guided man. Study his acts and words in the Gospels. Then study his words and actions in the New Testament Book Acts and Peter’s First and Second Epistles. Is Peter your Christian model of “before – and after?” Do a word search on Peter this week in the Gospels and spend time in his two epistles. His before-and-after-conversion-snapshot will inspire your Christian life. Yes, Jesus is coming again. Until then there is abundant life to be lived on this earth that God created for us. Like Peter, are you believing God daily in prayer and in the study of His Word? 16 For we did not follow cleverly devised tales when we made known to you the power and coming of our Lord Jesus Christ, but we were eyewitnesses of His majesty. 17 For when He received honor and glory from God the Father, such an utterance as this was made to Him by the Majestic Glory, “This is My beloved Son with whom I am well-pleased” — 18 and we ourselves heard this utterance made from heaven when we were with Him on the holy mountain. 19 So we have the prophetic word made more sure, to which you do well to pay attention as to a lamp shining in a dark place, until the day dawns and the morning star arises in your hearts. efore Jesus Christ’s return to the earth, the Bible predicts a resurrection and a rapture. Why? And what are they? This is a perplexing question the Bible answers fully. Scripture teaches that the first man, Adam, was created in God’s divine image. He was Elohim’s perfect creation, radiant in eternal life. So when death entered into the human experience through Adam’s transgression, God immediately set in motion a plan to counteract it. He would bring men back to what Adam originally was before the fall. To fulfill His redemptive plan, God would first overlook fallen man’s sin ritualistically to re-establish relationship through a symbolic rite of animal sacrifice (Lev. 17:11). God’s pronounced death sentence for Adam’s disobedience was immediately overshadowed by His compassionate decision to die in his stead. Every Old Testament sacrifice typified the offering of Jesus’ life blood on the cross. Once Jesus Himself fulfilled God’s plan of “vicarious substitution” (Heb. 9:11,12), He would recreate man on the inside with His perfect, eternal life (2 Cor. 5:1,17). But in the scope of God’s overall plan, born-again men have only been restored one-third of the way to what Adam originally was. Adam walked and talked with God personally (Gen. 2:19), with no need of a “go between” as the church requires today (1 Tim. 2:5). And that is where Christ’s church is heading again some day: “God Himself shall be among them and be their God” (Rev. 21:3). In that day, mankind will be restored into the radiant presence of God as beings completely recreated in His perfect image. But before this will happen, one more phase of God’s redemptive wisdom is scheduled, an immortal transformation into the kind of spirit-based body that Jesus displayed to the disciples following His resurrection from the dead. “See My hands and My feet, that it is I Myself; touch Me and see, for a spirit does not have flesh and bones as you see that I have” (Lk. 24:39). When this stage of salvation is finally fulfilled, the departed spirits of redeemed men and women will receive this new spiritual body, and those still alive at the time will be “changed” (allasso: to exchange one thing for another, to transform) and snatched heavenward to meet the Lord in the air (1 Thess. 4:17). “Behold, I tell you a mystery; we shall not all sleep, but we shall all be changed, in a moment, in the twinkling of an eye, at the last trumpet; for the trumpet will sound, and the dead will be raised imperishable, and we shall be changed. For this perishable must put on the imperishable, and this mortal must put on immortality” (1 Cor. 15:51-53). Jesus was resurrected (Matt. 28:6) and raptured (Acts 1:9) to ensure the redemptive fulfillment in man. When will it happen? You decide! The following are expert exerpts from the traditional pre, mid, and posttribulation Rapture views. Over the next months we will examine each on its own hermeneutic merits. Have fun. Get engaged! Eschatology Today Publisher, Mark Norris, M.A. From: Rapture Get Right or Get Left, and God’s Master Performance by Hilton Sutton, p. 55; 65, 66. If you search for a single verse of Scripture which states specifically that the appearing of the Lord Jesus Christ and the catching up of the Church is prior to the Tribulation, your search will be in vain. There is no such verse. But by studying the whole of God’s Word (which you should do), you will discover that the appearing of the Lord Jesus Christ is a certainty. The taking up of the Church to meet Him in the air is for sure, and it very definitely comes before the Tribulation Period can begin. In Revelation 1 we read that John, when in the Spirit, heard a Voice from behind which sounded like a trumpet. He turned to discover Jesus, from Whom the Voice had come. In Revelation 4:1 we read of a second encounter. Again John hears a Voice which sounds like a trumpet. When it speaks, he is immediately in the Spirit and in heaven at God’s throne. Although John was not taken bodily to heaven in the same manner described in Second Corinthians 12:2, his spiritual experience began with the same event awaiting all believers: a rapture. John’s experience parallels the Rapture of the Church described by Paul in First Thessalonians 4:16,17. Notice that John, according to Revelation 4:1, was looking or watching, and the Voice which he heard commanded him, ‘Come up here, and I will show you things which must take place after this.’ The things he would later witness could only take place after his arrival in heaven, again showing wonderful agreement with Luke 21:36: (“Watch therefore, and pray always that you may be counted worthy to escape all these things that will come to pass, and to stand before the Son Man”). 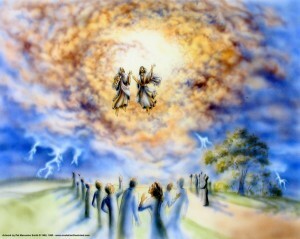 2 Immediately I was in the Spirit; and behold, a throne was standing in heaven, and One sitting on the throne. From: The End, by Norman B. Harrison, p. 75. St. Paul, by inspiration of the Spirit, definitely places the Resurrection and the Rapture of the saints through the coming of Christ “at the last trumpet” (1 Corinthians 15:51,52). This is a specific locating of the event. Unquestionably the Holy Spirit revealed the fact and inspired the recording of it. How dare any one locate it otherwise?…Can we postulate the Rapture at any other place than that given by and through the Apostle Paul and claim to maintain the integrity of God’s Word? Eschatology Today: Mr.Harrison counts trumpets in the book of Revelation. There is no other sequence of trumpets outside of The Book of Revelation to count in Scripture. Paul’s New Testament prophecies at times acknowledge the Old Testament, but mainly exist with the apostle John’s as the only New Testament Eschatology in the Bible. The last trumpet blows mid-way (midtrib) through Revelation’s text (Revelation 11:15-19) after the two witnesses are resurrected and raptured before the Saint’s judgment seat. From: Understanding End Times Prophecy, by Paul Benware, p 216. One supporter of this view prefers that it be called the “midseventieth week theory of the Rapture,” noting that his view “is popularly known as the midtribulational theory, but such a term gives rise to a possible misunderstanding.” Those who believe that only the second half of Daniel’s seventieth week (three and a half years) is the time of tribulation would see themselves as really advocating a pretribulational rapture of the church. 53 For this perishable must put on the imperishable, and this mortal must put on mmortality. From: Answers To 200 Of Life’s Most Probing Questions by Pat Robertson, p.156. This is just one of many references that indicate we will be going through a time of tribulation until Jesus Christ comes back. I do believe that Christians will be protected in the midst of tribulation, however. After all, the Israelites were protected when the plagues fell upon Egypt. Throughout history there have been successive martyrdom’s of Christians, and it is the height of arrogance to assume that only twentieth-century Christians in the United States of America will be spared any kind of persecution. That goes against the flow of history for the last two thousand years. Jesus said, “He who endures to the end shall be saved.” Persecution is simply part of living as a Christian in this world. The saints in China, Russia, and other communist countries have been tortured, have suffered privation, have had their jobs and their families taken away from them. Many of them have already died because of their witness for Jesus. It is hard to contemplate much worse tribulation than these great men and women of faith have already endured.